I am always on the look-out for a fun math game for kids. As you’ve all heard me lament over the past several years, math just isn’t Ben’s best or favorite subject, so I am usually thrilled when we get the opportunity to review another math program. This time, we are reviewing Math Rider. 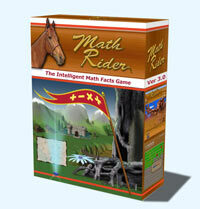 MathRider is an intelligent math game that helps solidify math facts with all 4 math operations from 1-12. This is Ben’s greatest area of struggle–memorizing his math facts. I dare say we are the perfect family to review this item! 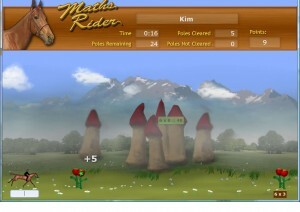 With this computer-driven game, your student mounts a horse and rides through a make-believe land on a “quest”. Quests include things like finding a magical flower or rescuing a princess. While he rides, the computer is gathering information about what he knows and doesn’t know, stores that information and then customizes the game for your student. This was great for Ben, because once he has mastered something, he is ready to move on. He does not like continuing to answer the same questions over and over. Feedback is also given of the mastery of each number fact, for each operation. the number nine needs more practice, and the top challenge is 8×8 (red). Grey squares mean these questions have not been tried yet. Each operation (addition, subtraction, multiplication and division) contains four quests, ranging from easy to master. The quests are the same in each operation, but the rewards change. Everything is automatically controlled, so that all your student needs to know how to do in order to play is key in numbers and hit enter. This makes the game easily played by kids of all ages. Recommended ages are 6-12. Ben has enjoyed playing MathRider. He gets very excited to master a level and I have seen some improvement in his regular math curriculum because he is getting quicker with his multiplication math facts. I believe that he will continue to improve as he continues playing MathRider. I only have one child, but for those of you with several kids will be happy to know that you will only need to purchase MathRider once. The game is set up so that several students can have an account with their own log-in and rider. The game will track each students progress and ability. MathRider can be purchased at this time for $37. The price is going up to $47 on 2/15. You can have a free 7-day trial to check it out before you buy though. They offer a 30-Day, 100% money-back guarantee, if you are not satisfied. MathRider can be used with Windows, Mac OSX, and Linux. Several major credit cards are accepted, as well as Paypal. I want to thank the folks at MathRider for the opportunity to review their game. Ben really does enjoy it! Read what other members of the TOS Crew thought of MathRider! « Friday Fun School ~ Today is a "sick" day . . .